Prospective homebuyers face a growing list of challenges -- from skyrocketing prices in Vancouver and Toronto, to soft conditions in Alberta, to another round of mortgage rule changes. But there are some good reasons 2017 is still a good year to buy a home in Canada. Prospective homebuyers face a growing list of challenges -- from skyrocketing prices in Vancouver and Toronto, to soft conditions in Alberta, to another round of mortgage rule changes. But there are some good reasons 2017 is still a good year to buy a home in Canada -- if you can afford it. Slowing price growth in Vancouver and Toronto is a positive development for would-be buyers. Spared from double-digit price growth year after year, purchasers will no doubt appreciate a pause, as it may crack open a window of opportunity. "[Supply] is not what is pushing new homes to record prices - stupidity is." Affordability is a serious concern in these two markets. In the GTA, resale home sales in Toronto hit a record high in 2016 for the second consecutive year, according to the Toronto Real Estate Board (TREB). The overall average price for 2016 was $729,922 -- up 17.3 per cent over 2015. On the new home front, lack of supply pushed average prices for single-family homes and highrise condos in the GTA to unprecedented levels in November 2016, according to the Building Industry and Land Development Association (BILD). The average price of new detached homes in the GTA hit $1.23 million in November, up 27 per cent from the previous November. The average new condo price rose 10 per cent to $493,137. Personal finance guru Gail Vaz-Oxlade has a slightly different view, and it has nothing to do with supply. "[Supply] is not what is pushing new homes to record prices -- stupidity is," she wrote in a recent Twitter exchange. "#MoreMoneyThanBrains." Easy credit, CMHC mortgage backing and "banks' greed" are the real causes, she says. A significant market correction might be the only solution, "but that'll just leave a whole lot of people upside down." We'll take a pause for the cause, instead. 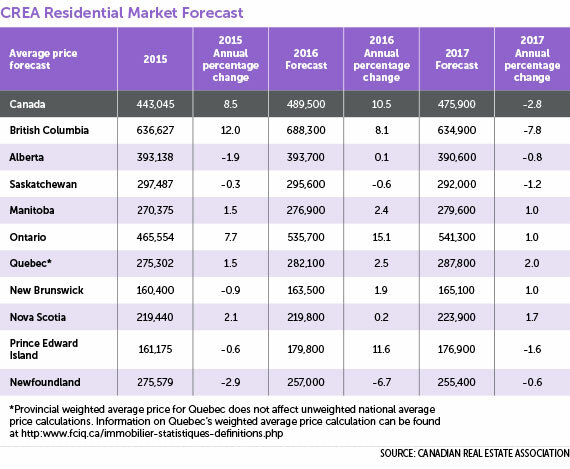 The Canadian Real Estate Association (CREA) provides one in the form of its average price forecast for this year. For B.C., it sees prices in Vancouver falling 7.8 per cent, compared to 8.1 per-cent-growth in 2016. For Ontario, it foresees prices climbing just one per cent, versus shooting up more than 15 per cent last year. "There will certainly be opportunity for first-time buyers in both markets," ReMax Vice-President Elton Ash told YPNextHome. "The challenge will be in the higher qualification rates for high-ratio mortgages. Once first-time buyers reset their affordability expectations, they will see price advantages in buying in 2017." The latest mortgage rule changes introduced by the federal government late last year were intended to stabilize "overheated" housing markets (mostly in Toronto and Vancouver), slow home price growth and keep mortgage indebtedness under control. What the changes also do, however, is make it more difficult for young Canadians to take that important first homebuying step. Homebuyers who apply for a high-ratio mortgage (less than 20 per cent down payment) now have to undergo a "stress test" by qualifying at a rate (4.64 per cent) you may not even actually have to pay (if you qualified for a mortgage at some of the current better rates, say 2.5 per cent). These changes may mean your buying power is reduced, but it's for your own good. The stress test is intended to assure lenders -- and yourself -- that you could still afford your payments if interest rates rise. You can also look forward to Ottawa releasing the National Housing Strategy some time in 2017. Canada has never had such a strategy, and given the growing importance -- and challenges- - of housing, only good can come from it. Canada has proven its economic mettle time and time again over the last several years. In its Financial System Review in December, the Bank of Canada says the Canadian financial system remains resilient as the nation's economy improves. Te proof is in the pudding in the way of the latest Statistics Canada's Employment Report, which says for 2016 as a whole, employment gains totaled 214,000 or 1.2 per cent, compared to 0.9-per-cent growth over the same period a year earlier. Just a bunch of numbers, right? Not exactly. Housing markets cannot thrive without a strong economy. Economic growth leads to employment growth, which leads to wage growth, which leads to consumer confidence -- which all leads to buying homes and household goods. Housing markets in Calgary and Edmonton remained relatively stable in 2016, with moderate declines in sales and average prices as a result of the extended recovery in the oil sector. The average residential sale price in Edmonton decreased by two per cent year-over-year, while in Calgary it dropped by four per cent, according to ReMax. Buyer activity is expected to pick up slightly in the second half this year, as the economy and employment improve. On the new home front, housing starts -- an important sign of economic health -- are beginning to rise. "A member survey showed home starts are expected to rise a modest 5.7 per cent in 2107," Donna Moore, CEO of CHBA - Alberta, told YPNextHome. "That optimism likely reflects gains of almost 50 per cent in oil prices last year that are raising consumer comfort levels after a couple of tough years for the economy." Vaz-Oxlade's concerns notwithstanding, it's fair to say Canadians have benefited from the prolonged period of historical low interest rates. Most experts don't see any significant change here for 2017. "It's no secret that fixed mortgage rates are closely correlated with bond yields," says Andrew C. MacDonald, client account manager at Calum Ross Mortgage, Toronto. "We've already seen an upward movement in bond yields from historical lows, and most lenders have started to raise interest rates slightly, as a result. The good news is rates are still hovering just above historical lows, which makes now a great time to purchase (or refinance) a home."